In the jungles of New Guinea, February 1944, an American G.I. named Ed Downey was driving a jeep on the primitive roads near the 5212th Photographic Wing. During the trip, his jeep broke down and he got out to fix it, he heard a faint whimpering that appeared to be coming from the tall grass next to the road. Downey soon found a young adult female Yorkshire Terrier abandoned in a foxhole. 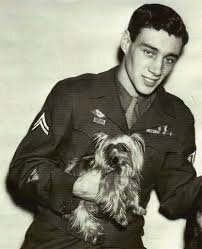 Downey, a dog hater, later gave the Yorkie to Sergeant Dare. In March, Ed Downey’s tent-mate Corporal William A. Wynne of Cleveland, Ohio saw the Yorkie and told Dare that he will give him two Australian Pounds($6.44 at the time) for her. Wynne called her Smoky and at the time he thought she wouldn’t live. But Wynne grew up with dogs, he took care of her and started teaching her tricks. Wynne caught dengue fever shortly after adopting Smoky and was sent to the 233rd Station Hospital. A couple days later, some of Wynne’s friends brought Smoky to see him. The nurses loved the dog and her story and wanted to show her to the other patients. For the five days they were there, Smoky would sleep with Wynne then the nurses came in the morning to bring her to the other patients and returned her in the evening. Wynne saw the impact Smoky made to the wounded, how they cheered up and laughed, especially while they were watching her chase Queensland Alexandra Birdwing Butterflies that were larger than herself. They also love the numerous tricks Wynne taught her. Throughout the war, Wynne and Smoky traveled the southwest Pacific with the Special Services to hospitals and bases to entertain the troops and increase morale from Australia to Korea when it was liberated. In New Guinea, she lived in Wynne’s tent with a bed made from a green felt card table cover with Wynn sharing his C-rations and occasionally, a can of spam. She had to face the extreme tropical heat and humidity, coral and survived 150 air raids. Shealso jumped seven times from a 30 ft tree with a parachute made specially for her during the Best Mascot for the Southwest Pacific Area event. It worked, she won first prize Mascot in Yank Magazine in competing with over 400 entries. Wynne was in the service from January 12, 1943 till November 27, 1945. He served for 24 months as a lab technician and camera installer for F-5 Lightings in the 5th Air Force, 26th Photo Recon Squadron and 6th Photo Recon Group in New Guinea, Biak Island, Luzon, Okinawa and Korea. Between September and December 1944 he flew 13 missions in PBY Catalinas as an aerial photographer in the 3rd Emergency Rescue Squadron from Biak to Ceram, Halmahera, Celebes, Borneo and Mindanao. Because of that, Smoky was also part of the 5th Air Force and came along, not always happily, dangled from a pack for long hours in 12 missions. Wynne credits Smoky to saving his life when he was aboard an LST that was being attacked. With all the confusion and anti aircraft gun fire, Smokey got Wynne to duck as a shell hit eight men next to him. He calls her his “Angel From A Foxhole”. When Wynne was transferred to the Lingayen Gulf Airfield near Luzon, Smokey became a hero when the Signal Corps needed to line out a telephone wire through a 70ft long culvert with an 8” diameter that was under a runway. In some places of the pipe, the dirt filled it in so there was only 4” of space. Wynne told NBC-TV of Smoky’s heroism after the war. Smoky saved 250 men having to move 40 aircraft and dig out the taxiway which would’ve endangered everybody at the airfield. It could have taken days and the Japanese raided the airfield everyday. Smoky did it in minutes. In Okinawa, she survived a typhoon. As Smoky was an unofficial war dog she did not get access to veterinary treatment or formulated dog food. Despite everything, she never has gotten ill or injured. When Wynne and Smoky returned to the States, they were featured in a one page story with photographs by the Cleveland Press on Dec 7, 1945 and quickly became famous across the nation. For the next ten years, they traveled to Hollywood and all over the world so people can see Smoky’s incredible tricks such as; walking on a tightrope while blindfolded, riding a homemade scooter and even ‘spelling” her name. Eventually they were featured in some of the earliest Television shows around Cleveland and later made a show of their own call “Castles in the Air”. In this show, Smoky performed in 42 episodes without ever repeating a trick. Throughout the 1940's and 50's they entertained millions of people and they were especially popular in veteran hospitals. Sadly, on February 21, 1957, Smoky unexpectedly died at the age of 14. Wynne carefully buried her in a shoe-box in Cleveland Metroparks, Rocky River Reservation in Lakewood Ohio. Smoky was awarded 8 battle and 12 mission stars, promoted to Corporal and is considered the first therapy dog. She is also responsible for the renewed interest of Yorkshire Terriers as it was an obscured breed at the time. In 1996, William Wynne wrote a book called “Yorkie Doodle Dandy, A Memoir” which tells his life story with Smoky. He is currently writing a second book called “Angel in a Foxhole”. In November 11, 2005, a two ton blue granite memorial with a bronze sculpture of a Yorkie in a Gi helmet on top with the the words ‘Smoky, Yorkie Doodle Dandy and dogs of all wars” engraved was unveiled on the spot she was buried. Today there are several memorials honoring this brave, dedicated pup nationally.